Hi Steve: I’ve never written to you before but felt I just had to this time. I watched to your 7 Footprints of God DVD’s and your Defending the Eucharist, and it was awesome. I am a new Catholic. I became Catholic as of last Easter vigil. When I went to the R.C.I.A classes I was very upfront with why I was there. I said I just wanted to know what the Catholic church believed and why my Grandmother believed what she did. To me it was very strange. I told everyone in the class I had no intentions of becoming Catholic. I was just curious. I was baptized Catholic as an infant, but never grew up in the Faith because my Parents died when I was 3 or 4 years old. My mother was Catholic, but my Dad was an Atheist. I lived in 15 different foster homes before I was 10 years old. My foster parents were Christian Reform. But thru out my childhood, I always had a memory of my Grandmother praying her Rosary everyday. I needed to find out why. It took me over 50 years to walk into a Catholic church. 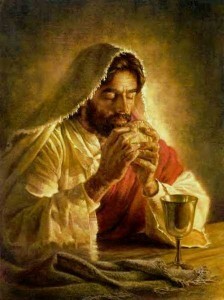 All my years as a Protestant, I took the Lord’s Supper for granted. And why not. After all, its just a symbol, right. We had it the first Sunday of each month. I kept looking to the clock at the back of the church thinking…”For crying out loud, will you hurry up with the bread and wine. I want to get out of here.” Steve, I just wasn’t into the Lord’s Supper at all. If its just a symbol…why do it? Easter vigil came, and there I was, doing the one thing I said I would never do. I was becoming Catholic. I fully understood what the Eucharist was, is, and will always be, and when I took it for the very first time, I cried my heart out because for the first time in my life, I knew I was truly taking the Body and Blood of Christ. What an awesome Blessing this is. I’m now part of the Eucharistic Ministry in my Church. I’m the only one in my family who is Catholic, but I’m working on them. For now I will not just BE Catholic…but LIVE my Catholic Faith as a witness for my family and friends.